Examining my DNA – God Save the Queen! Being a bit of a genealogy geek, it was only a matter of time before I found myself spitting into a tube in order to have my DNA tested by AncestryDNA. I know I wrote about my trepidation in this blog post, but I must admit, I was incredibly excited to see if it would prove or disprove my family history findings. Ancestry says that it could take 4-6 weeks for the results to come in. I was pleasantly surprised to get an email 3 weeks later. It was in early?!? Fantastic news! DNA matches are broken down from people that have had their DNA tested and are possible matches for you. Due to privacy, I won’t get into too much detail on this section, but it can certainly help you expand your family tree as you will certainly find cousins you never knew you had. This is what everyone who does a DNA test is initially looking for. The DNA is examined for certain markers which help indicate where in the world your ancestors have come from. If you want to know more about the science of it all – click here. Below the pie chart, I was able to open a link which went into greater detail about my full ethnicity estimate and everything shows that I am 100% European. This matches with my family history research thus far but the breakdown was a bit surprising. The AncestryDNA team has included quite a bit of information about how the DNA from Great Britain can be complicated. Yes it has been strongly influenced by the Romans, Anglo-Saxon, Vikings and Normans, however through testing and research original native populations were able to survive even with invaders joining their population. And in my opinion this is where it gets interesting. 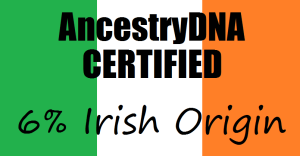 I have 87% of the DNA markers they expect from someone from Great Britain. The average native only has 60%! I know that my paternal grandfather’s family lived in the same tiny village for at least a few hundred years. My great-grandparents on my paternal grandmother’s side were also from a small remote village but in Scotland. Could my ancestors from my father’s side of the family be that closely related to the original people of Great Britain? My mother’s side has a lot more history in North America – going back at least 250 years. This test proves the majority of them must have originally been from the British Isles as well. How incredilby unexpected in my family tree! The AncestryDNA team has gone into great detail about Great Britain in the profile. It explains the history of the area, which other regions might be found in the DNA and even provides hints about why people may have emigrated away from the area. It’s all so fascinating to know that these are my ancestors! 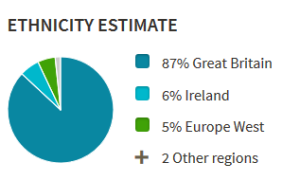 I can’t believe I found all of this information just by looking at the top location in my ethnicity estimate and I can’t believe that I have more pure British blood than the average person from Great Britain. And so I say to my breathern, God Save the Queen! Ethnicity Estimate map for Corina Harris through AncestryDNA.